Ziad Ali and his family in their ‘home’ in Switzerland. Credit: Ray Smith/IPS. LUCERNE, Switzerland , Jan 25 2014 (IPS) - Switzerland facilitated family reunification for Syrians in September. So far, more than 1,100 Syrian refugees have benefited from the programme, while thousands are waiting at Swiss embassies in the region, hoping for a similar chance. Surprised by these numbers, Switzerland put an end to the programme. Several European countries responded to an appeal by the U.N. High Commissioner for Refugees (UNHCR) last summer to admit Syrian refugees. Switzerland announced it would accept 500 “especially vulnerable refugees” over three years. Either Swiss authorities were surprised by these numbers, or considered their humanitarian action short-lived. Further, the country that hosts about 2,000 citizens of Syrian origin pledged to open its borders for their relatives. By the end of November, Swiss embassies in Turkey, Lebanon and Jordan had granted 1,600 Syrians a three-month entry visa. At least 1,100 of these have already travelled to Switzerland. A further 5,000 Syrians have applied for appointments at Swiss embassies to file similar visa requests. Either Swiss authorities were surprised by these numbers, or considered their humanitarian action short-lived. Already in early November, they introduced bureaucratic hurdles: Swiss-based Syrians who had invited their relatives now needed to meet certain financial requirements. Meiner’s warnings fell on deaf ears. Even worse, a month later Swiss Justice Minister Simonetta Sommaruga cancelled the family reunification programme entirely. “We assume that most of those Syrians who are entitled to apply for entry visas and face immediate distress have made use of our eased visa requirements,” she argued. Ashti Amir, a Kurdish Syrian who fled to Switzerland for political reasons more than a decade ago and now runs the charity SyriAid, has a different perspective. Since September, he managed to get the families of one of his brothers and sisters to Switzerland. Amir told IPS that he still had two brothers and his parents back home in Aleppo and wanted to get them to Switzerland, too. “Escaping from there and travelling to an embassy abroad is not only difficult, but very costly,” he said. Amir knows dozens of other compatriots who have relatives in danger in Syria whom they want to rescue. Another sister of his as well as a sister-in-law are stranded in Istanbul with their families, waiting for an entry visa to Switzerland. They had applied for an appointment before Switzerland cancelled its reunification programme, and Amir is optimistic that they’ll finally be granted a visa. SFH’s Beat Meiner says that many Syrians have embarked on a dangerous trip to Swiss embassies in the Middle East, assuming they can successfully apply for an entry visa there. “Some of them are blocked now: they may neither come to Switzerland, nor return to Syria,” he says. He’s convinced that Swiss humanitarian action could have been prolonged and that considerably more human lives could have been saved. Besides that, Switzerland also hesitates to treat about 2,000 asylum requests by Syrians who had fled to the country individually rather than as families. Some of them have been waiting three to four years for a decision. IPS met Ziad Ali and his family in central Switzerland. Originally from Malikiyah in the northeast of Syria, Ali moved to Damascus as a youth, where he earned his living as a taxi driver. “As a Kurd in Syria, you took any job you may get anywhere,” he says. Before he fled the country, Ali worked in Idlib region as a gardener. He was arrested at a demonstration in Qamishli and then tortured in a prison in Deir az-Zour in Syria. After his release, escaping the country appeared to him the only option. His wife and their two children reached Switzerland in June 2011, while Ali followed in January 2012. Ali says the fate of his sister and his father, who were arrested by the Syrian regime in 2011, is constantly on his mind. He hasn’t heard from them since then. His daughter Fatima and his son Mohamed go to school locally and already speak better German than Kurdish. A year ago, their youngest brother Azad was born. 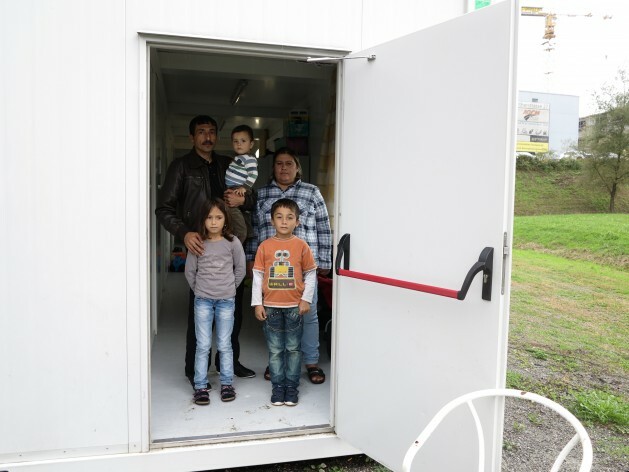 The family lives in a barracks established for asylum-seekers, occupying three rooms. Their asylum request is still in limbo, leaving the family in constant insecurity about their destiny. Moreno Casasola, secretary-general of the refugee rights organisation Solidarité sans Frontières, says that asylum requests of Syrians are mostly put aside by the Federal Office for Migration. Like any other European country, Switzerland fears that answering asylum requests positively would attract even more Syrian refugees. Federal Office for Migration spokesperson Michael Glauser acknowledges that asylum requests of Syrians aren’t treated with priority. He denies, however, any decision moratorium. Glauser asserts that Syrian asylum-seekers enjoy Switzerland’s protection – and for the moment haven’t been sent back to Syria. Ziad Ali and his family, along with other Syrian asylum-seekers, have protested in front of the Federal Office for Migration in Bern, demanding a speedy decision on their request. Getting at least temporary official admission would give them a perspective for the next few years and facilitate hunting for a job. Why should the Swiss mess with their country for refugees who are alien to the culture? Looking at the mess Euro politicians have made of the invasions they would be justified in allowing none. So inviting an alien non-assimilation culture will have a positive effect? Don’t think so? The softy European nations are not learning from previous policies. Look at both France and Belgium and how crowded they are with the unworthy. Why cant Arab states with all their wealth accommodate their kin the Syrians!